The Cambridge School of Weston is an independent progressive secondary school founded in 1886 in Cambridge and today comprising 63 acres in a suburban wooded area of Weston. In 2010 CRJA-IBI Group was invited to CSW to guide the update of the master plan that CRJA-IBI Group and the school developed in 2004 in anticipation of the construction of a green interdisciplinary Science/Art Building. Six years later, with the Garthwaite Center for Science and Art a reality and the school once again anticipating the addition of a large new building to be the centerpiece of the school’s new Health and Wellness initiative, CRJA-IBI Group was brought back to the campus. Recognizing the impact of such a project on the intimate scale and natural beauty of the campus, CSW turned to CRJA-IBI Group to create a plan that would identify the optimum site for the new center. Through a series of five campus workshops facilitated by CRJA-IBI Group, a revised master plan emerged that identified the reuse of existing buildings, described a new sense of entry for the school, and proposed sites for new dormitories and new classroom space as well as the Health and Wellness Center. Critical to the success of the plan was its response to the school’s mission and goals and the unique character of its campus and setting. Through the workshop process with CSW, CRJA-IBI Group helped the school recognize the uniqueness of its character and setting—a tight association of eclectic buildings nestled around a central quad all within the embrace of wooded hills—and to enhance this character through the proposed additions to the campus. Beyond the central core, between and below the wooded hills, lie the playing fields and dormitories. 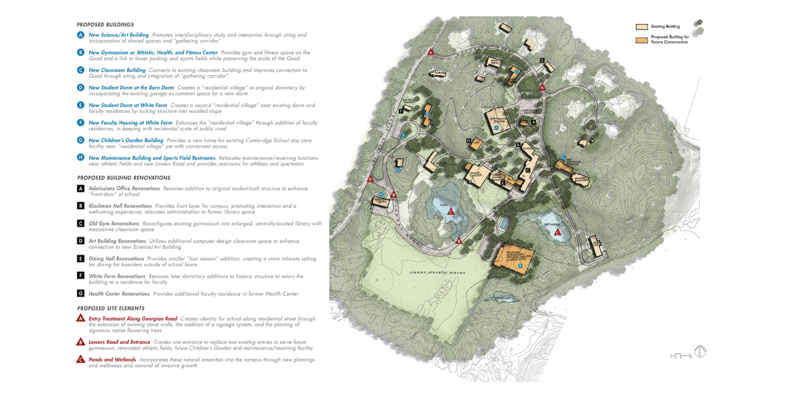 Often located in proximity to the woodlands and the residential fabric of the Town of Weston, future dormitories proposed for the school respond to its desire to create accessible residential villages while retaining the wooded hills and being a good neighbor to the surrounding community members and blending with the residential fabric. Improving campus connections from the outlying athletic fields and dormitories is achieved through the careful location of new buildings, the incorporation of gathering corridors within the proposed buildings, and the enhancement of a system of woodland walks to provide safe connections between dormitories and to the central quad that contribute to CSW’s health and wellness initiative and to the sense of community on the campus.